Professional barcode image creator application is high quality, advance and powerful utility which facilitates fast, easy and accurate data entry process to increase security or efficiency of any organization and also makes decisions quickly. Download barcode generator software that modifies colorful barcode images by producing changes in background colors, length, shape, size, page, font settings and other dimensions. Freeware barcode label making software creates barcode labels with help of font standards such as Code bar, Code 11, code 128, Code 128 Set A, Code 128 Set B, Code 128 Set C, Code 39, Code 93, Code 39 Full ASCII, UPCA, UPCE, USPS sack label, USPS tray label, USS-93, Postnet, Planet, MSI Plessey, LOGMARS, EAN 13, EAN 8, ITF-14, ISBN 13 Industry 2 of 5, Interleaved 2 of 5, Standard 2 of 5 and many more. Barcode generator software is useful in several areas as Billing, Shipping, Manufacturing, Libraries, Telecom sectors, Pharmaceuticals, Transportation, Retail store, Price marking and many other departments. Features: * Best barcode image producer software runs with support of different types of major Windows operating system versions like Windows 2000, 7, 2003 server, 2008 server, ME, NT, XP, VISTA etc. * Free barcode image builder application provide fast selling of several products and data item by reading barcode images, tags with help of professional , standard scanners, readers. 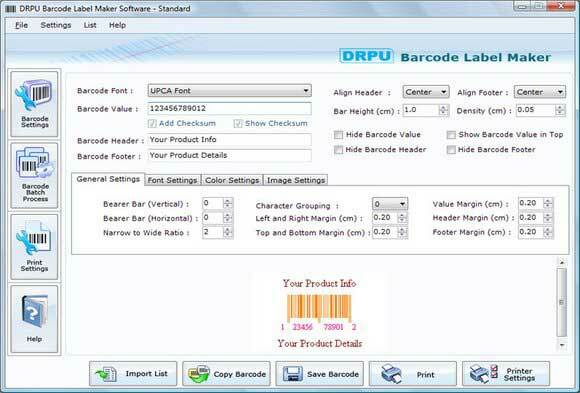 * Barcode generator software provides facility to use interactive graphical user interface which makes program more applicable for all types of users as beginner and practiced one. * Freeware barcode image creating utility builds several copies of same barcode images, stickers, asset tags etc on single paper. * Download barcode image producing program that scans, prints products of any business utility which is designed to increase organizational efficiency and security of all industries as low to high.